Gold medallists two days earlier, pivotal to Nigerian success in the Men’s Team event at the 2018 ITTF-African Championships in Port Louis, Mauritius; both Segun Toriola and Bode Abiodun made impressive starts to their campaigns in the Men’s Singles event on Friday 7th September. However, the players to attract the attention were Mawussi Agbetoglo, Soudes Alassani and Kokou Dodji Fanny; they were key players in the very creditable third place gained Togo. In the opening round, Mawussi Agbetoglo beat the host country’s Jason Pontoise (11-3, 11-5, 11-4, 9-11, 11-8), the win coming after Soudes Alassani and Kokou Dodji Fanny had ended the progress of adversaries from the Seychelles. Kokou Dodji Fanny accounted for Nicholas Esther (11-4, 11-4, 12-10, 11-6), Soudes Alassani ended the hopes of Godfrey Sultan (11-9, 12-10, 8-11, 11-5, 11-2). The only disappointment for Togo in the opening round of the Men’s Singles event was the defeat suffered by Atarou Assou; he was beaten by Olajide Omotayo (11-2, 11-9, 11-8, 11-3), who like colleagues Segun Toriola and Bode Abiodun, reserved second round places. Segun Toriola beat Beni Lukatikish from the Democratic Republic of Congo (11-7, 11-4, 11-8, 11-3); Bode Abiodun accounted for Eritrea’s Tekle Erfem (11-1, 11-2, 11-1, 11-2). 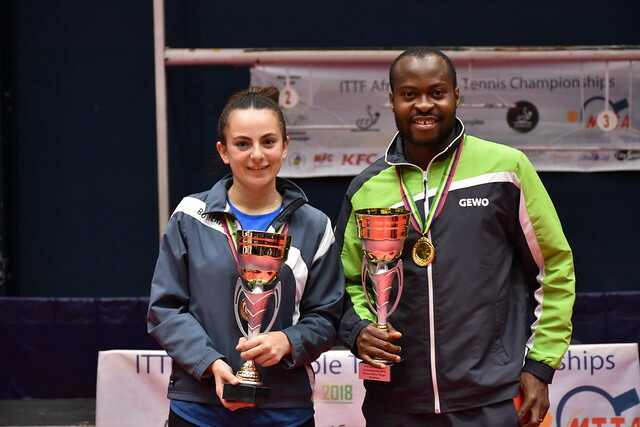 Success for Nigeria but there was also defeat; Tobi Falana lost to Aly Ghallab (11-4, 11-6, 11-8, 9-11, 13-11) in a round that witnessed success upon success for Egypt (11-4, 11-6, 11-8, 7-11, 9-11, 13-11). In addition to Aly Ghallab, Shady Magdy beat Algeria’s Sami Kherouf (11-5, 11-5, 10-12, 12-10, 14-12); Youssef Abdel-Aziz ended the hopes of ended the hopes of the host nation’s Akhilen Yogarajal (11-4, 13-11, 11-7, 11-7, 11-6). Notable performances and there were also most worthy efforts from South Africa, who had secured fifth place in the Men’s Team event. Shane Overmeyer beat Madagascar’s Rado Rasolomalala (11-6, 13-11, 11-8, 11-3); Kurt Lingeveldt and Terrence Mathole ended Mauritius aspirations. The three leading names, Nigeria’s Quadri Aruna, alongside Egypt’s Ahmed Ali Saleh and Mohamed El-Beiali received direct entries to the second round; the second, third and quarter-final rounds of the Men’s Singles event will be played on Saturday 8th September.